This poem, written by the 16-year old Rimbaud, is partially in the classic form but already announces his future avant-garde poems. When he wrote this piece, France was at war with Prussia, and Rimbaud was frequently running away from home and traveling by foot. 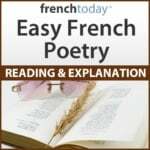 It is therefore possible that the scene described in the poem is a real scene. Is shinning: it’s a little valley bubbling with sunlight. Pale in his green bed where the light falls like rain. Nature, rock him warmly: he is cold. Peacefully. He has two red holes in his right side.